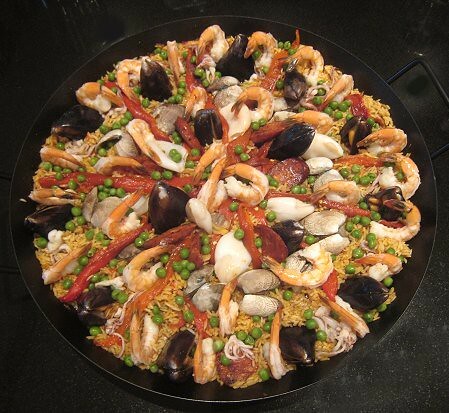 We couldn't well have a Spanish-inspired menu without having a paella, could we? I have made paella several times before; unfortunately, I cannot say I have perfected the technique as yet. My previous paellas, although delicious, have always turned out too wet for my liking. 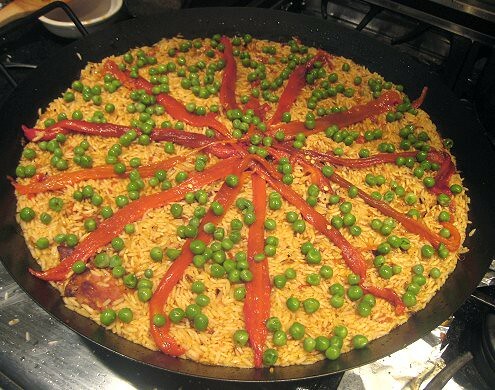 This fear of too-wet paella was hanging over my head for days before the party. Of course, the logical thing to alleviate the fear of failure would have been to do a test run before the big day to iron out the kinks in my paella technique -- but, of course, not being a logical, industrious sort, I did not. We came up with another solution to the problem and please tell me if it isn't the most brilliant solution ever. Unfortunately, our brilliant solution was too brilliant and had me doubly worried. I had never made fideuá before. 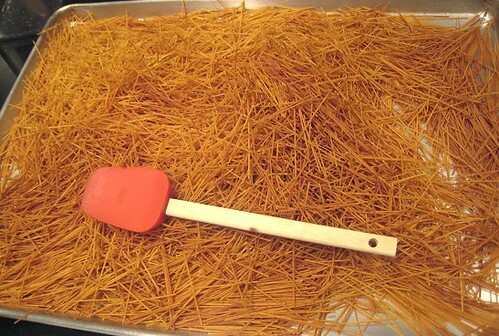 Actually, I have never even seen nor eaten fideuá before. This was jumping ahead into the total unknown. So now, instead of the intermittent scenarios of failure in my head throughout the day, I started to have constant playback, resulting in quite a sleepless night before the big day. I tossed and turned until 2:30am, watched some TV until 5:30am hoping to fall asleep. I finally gave up and ate breakfast at 6:30 calling it the start of my day. I, on the other hand, slept well that night. Teehee. We didn't really have a recipe to work off of. JS simply did what she would've done to make paella. But first, the noodles. 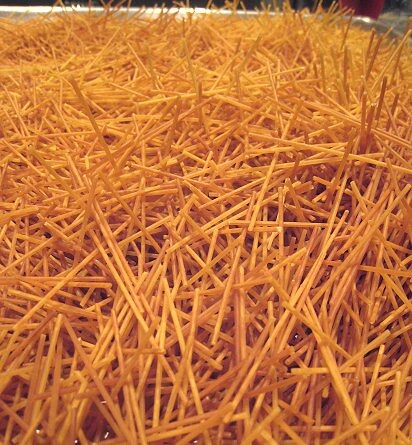 Interestingly enough, Gourmet Today had a recipe for "Fideos with Mussels" and from that recipe, we gleaned some tips. Like, substituting spaghetti for the fideos. JS and I decided to use spaghettini as spaghetti seemed too thick. 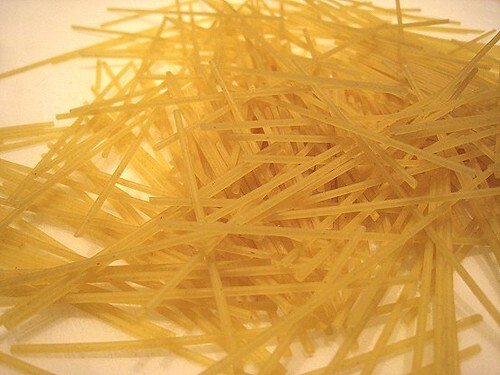 The day before the party, I proceeded to break the spaghettini up into little pieces. TS and I had some discussion on how long the pieces should be. I was under the impression that it should be around the size of a rice grain or just slightly bigger, so I settled on 1 inch as the ideal length. I thought that was a little insane, as how am I supposed to break noodles into 1-inch pieces?! 2 inches seemed a more feasible size. We consulted the Gourmet Today recipe for fideos, and it said to break it up into 2 inches. I thought 2 inches might still be a tad long, but being outvoted by TS and Gourmet, I went along. The easiest way to break the noodles was by hand. The broken noodle pieces went into the oven to toast. We played it safe and toasted the noodle pieces at 250F. After half an hour, I went to check on the noodles but most of them were not even halfway done. I tossed the noodle pieces around and was tempted to crank up the oven temperature. TS warned against this brash move, cautioning that things can turn pretty ugly pretty quickly in the oven. One minute everything is beautiful and golden brown, the next black and burnt. It took more than an hour, closer to 90 minutes, to get the noodle pieces all nice and toasted. Look at our huge baking sheet! We used 4 pounds of spaghettini! We set the noodles aside for the next day and called it a night. We were cooked out as I had been working on our cocido all this time while TS had been battling some beef tongues (for lengua estofada). On the day of the party, I set about prepping the rest of my fideuá ingredients. 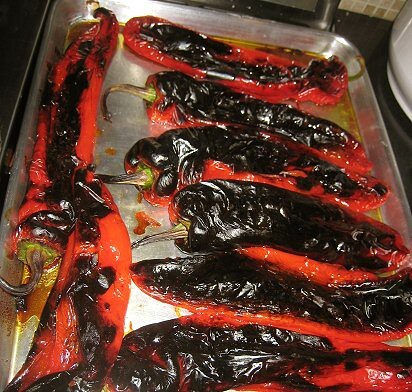 I roasted off some sweet peppers, while JS browned/fried some chorizo coins. I was ready to make sofrito. I didn't know how much of the sofrito I would need for 4 pounds of noodles, so I erred on the side of caution and made a very big batch. 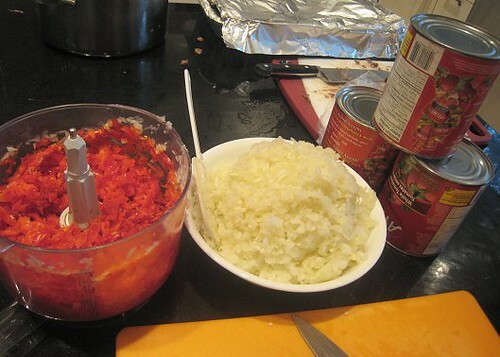 I processed about 6 bell peppers, 3 onions, and used three (3) 28-oz canned whole tomatoes. 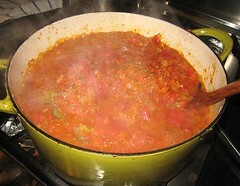 I used the rendered chorizo fat as my oil, and started to cook the processed bell peppers, onions and tomatoes. I seasoned the mixture with smoked paprika, salt, pepper, and some bay leaves. Given the quantity, it took quite some time (around 3 hours, I would hazard) for it to cook down to the sofrito-like consistency. While the sofrito was cooking down, I proceeded to make the seafood saffron stock. 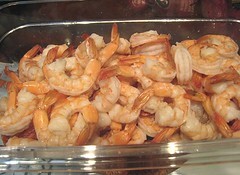 We had a bagful of shrimp peels saved over quite some time, and finally, I'll be able to get rid of them! I cooked the shrimp peels with an onion, a couple sticks of celery, and a couple of bay leaves. To boost volume and flavour of my stock, I also added a couple of bottles of clam juice into the mix. 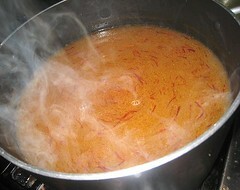 After straining the stock, I added a generous pinch of saffron. 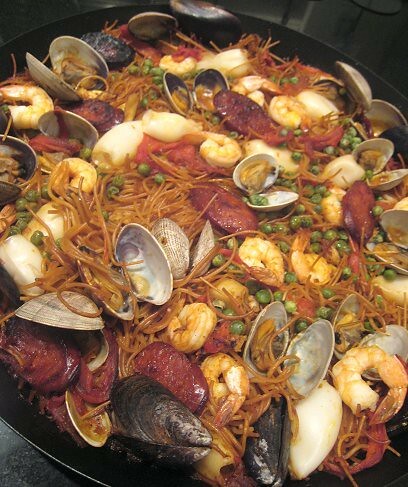 It was time to get to the part that was giving me most grief, the seafood portion of the paella, erm, fideuá. Given that I knew I was going to be cooking at least 2 batches of fideuá for the party, and given that I don't know how long the noodles take to cook, I was at a total loss as to the timing of the dish. I thought that the best way to minimize my risk of failure was to cook the seafood beforehand and just put the seafood on top towards the end of the cooking time. 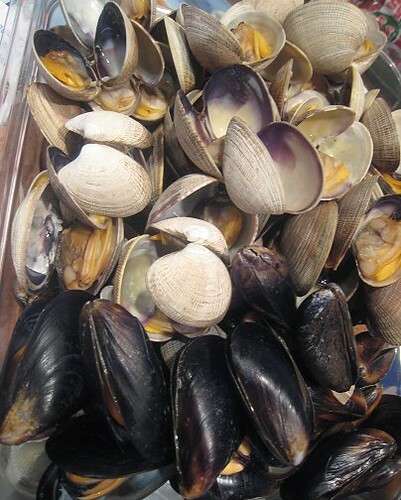 I steamed the mussels with a splash of white wine, and did the same for the clams. 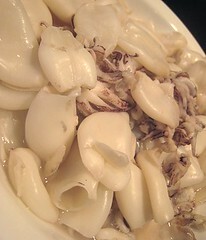 I used the resulting to poach the squid and the shrimp. I then put all the liquid from this batch of cooking back with my shrimp-clam stock to be the seafood stock for my fideuá. 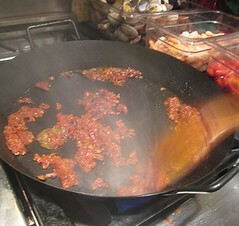 Yes, once again, that above is paella-in-the-making, not fideuá. Then it was showtime, the time I've been fearing and dreading for several days. 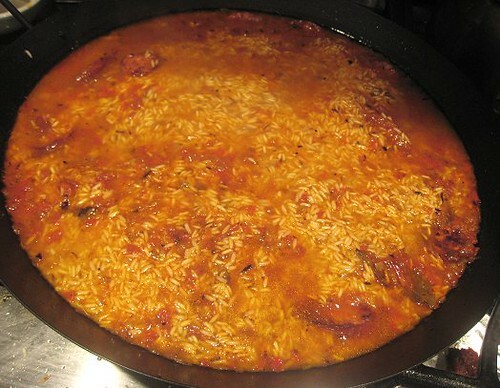 The actual cooking of the fideuá. I took a big breath and forged ahead. There's the set-up that JS had for her fideuá cookery. 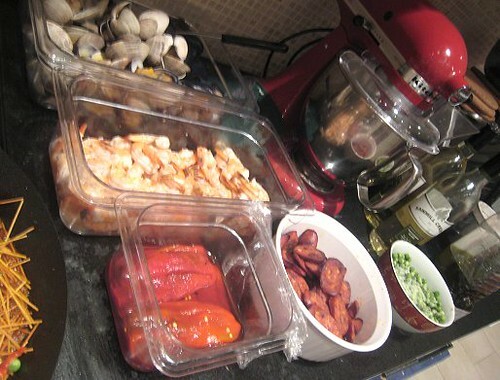 There was the container of mussels and clams, shrimp, roasted and peeled red peppers, fried chorizo, and peas. Of course, the seafood saffron stock and the toasted short noodles were also standing by. In went some oil, then the sofrito. A splash of white wine, and then a couple of ladles of my quick seafood stock. Then, I added the broken noodles and added more stock -- more than enough to cover them -- to cook the noodles. Just pretend those are short noodles there, not rice. I was too busy with finishing our other dishes that I didn't get to take pictures of the whole process. After the noodles have cooked for several minutes and are 95% done, I started to layer in the other ingredients, starting with the roasted peppers, then the chorizo, and then the seafood components: mussels, clams, squid, shrimp. For a festive touch, I added some peas. I put a couple of ladles of seafood stock to wet the ingredients on top and then put the pan into the oven for about 5 minutes to let the final infusion of liquid get soaked into the fideua. I found it a little bit messy-looking though, the broken noodle pieces going every which way, being all unruly. The flavour was intensely seafood-y, even when eating just the noodles without the juicy, plump pieces of mussels, clams, squid, and shrimp. The roasted peppers and peas added some sweetness to counterbalance the richness. 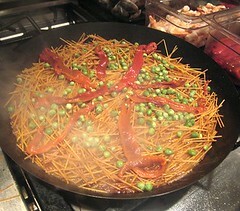 In fact, our brother complained about the "paella" being made with noodles! Couldn't help it so the next day, I made paella with the leftover ingredients. We had so much leftover seafood that I was able to make, not one, but two batches of paella. 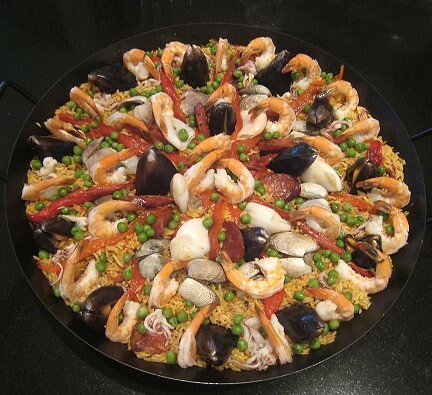 My New Year's meal was a very satisfying combination of seafood paella and Spanish-style Stewed Tripe. I'd say my year started off right! 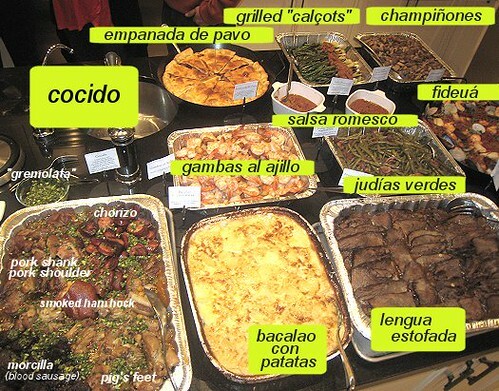 See the rest of our Spanish-themed New Year's Eve Menu here. 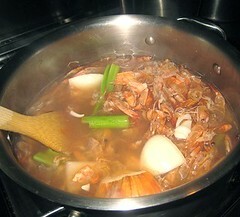 For seafood stock, make it from shrimp peels, or fish bones, or any combination of seafood. 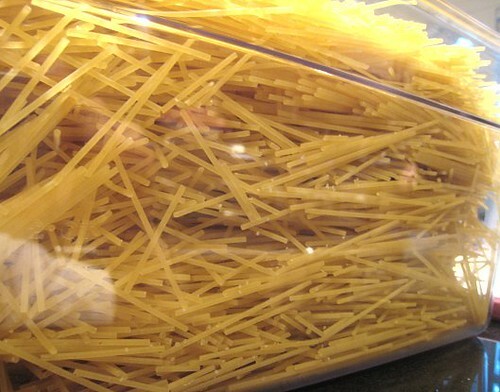 If using noodles, break them into 2-inch pieces. Then, roast in the oven at 350F until golden brown. Alternatively, one can also pan-fry them in a little olive oil on the stovetop. Set aside. Purée the sofrito ingredients in the food processor. Set aside. 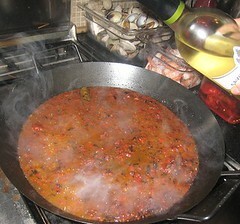 Heat olive oil in a paella pan or a large pan/pot over medium heat. 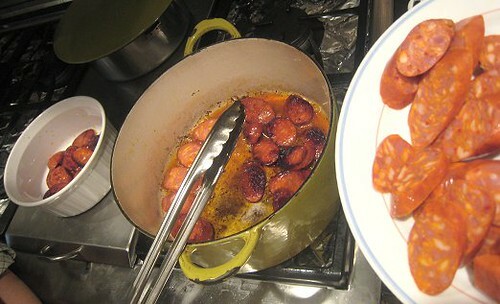 Add chorizo and cook until golden. Take out chorizo pieces and set aside. In the same pan with rendered chorizo fat and olive oil, add puréed sofrito ingredients. 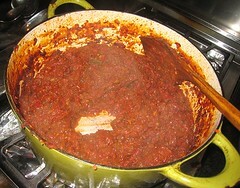 Add smoked paprika and bay leaves. Cook until almost all of the moisture has evaporated. Add white wine into the pan and let alcohol cook out. Add the toasted/fried noodles or rice into the pan and stir until coated. Add seafood stock and saffron. Reduce heat to low. When the noodles or rice are almost cooked (90-95% cooked), add the roasted peppers, peas, and the seafood: mussels, clams, shrimp and squid, arranging them as you wish onto the noodles/rice. Cook until the seafood is cooked through. (One can cover the pan with foil to accelerate the process.) Serve and enjoy! Wowza! This a fantastic offering of gi-normous portions! Very ambitious and beautiful photos. Congrats on both versions. 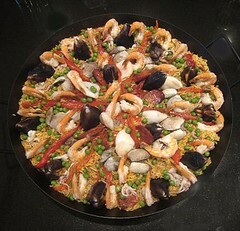 really looked beautiful ....did you use a paella pan? i use it for chicken rice soup, but i will buy more when we go to dubai.i'll try your version.did you use a special rice or jasmine rice will do.i also save my shrimp shells and use it for my noodles and they can't belive how good it is. Oh wow! 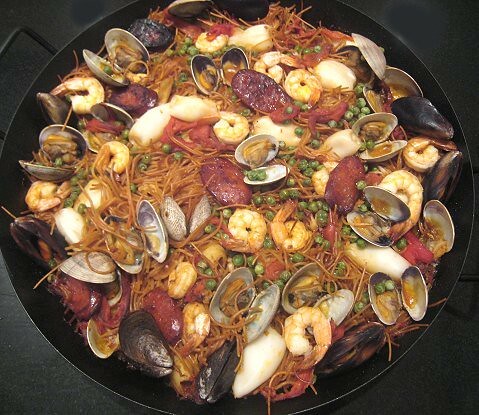 It looks great -- don't mind the mess as fideua is not a neat dish ;) I LOVE fideua...more than paella actually, although many do not share my view (especially not here in the Philippines where everyone is so paella-centric and not many know about fideua)! The ones I've had in Spain were actually pretty simple, hardly anything but some bits of squid in it...but the flavor was out of this world! With some lemon and aioli...MMM! 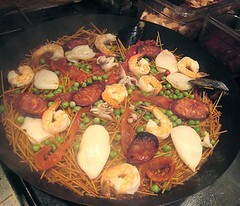 Both your paella and fideua look amazing! Yes, we acquired some paella pans right before the party, hehe. I don't know how "authentic" they were, though. Basically they just had the shae of paella pans. The yellowish-green pot is enamel-covered cast iron, I believe. Although, I don't think that is necessary. Oh, we just used what we had on hand, which was jasmine rice. Thanks for visiting! Hehe, I think our household also prefers paella (as opposed to fideua). Oh, aioli as a condiment: we'll have to try that next time!